while the case is being loaded. 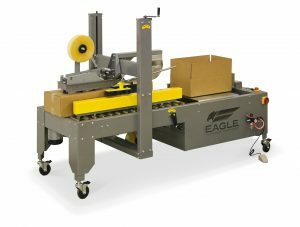 You can also opt to add the EZ-Tape Bottom and Top sealer if you want to produce a ship-ready box. Our automatic case packing and loading machines are specially built to side load containers, cartons, boxes, and jugs. engineered to load products in several patters for cases and trays. As a matter of fact, we have already developed a packing machine that is capable of executing four packing solutions. The erecting, forming, loading, and sealing of the case are now made possible with just one compact machine, the All In One. Not only is it versatile, but it’s multi-faceted and can handle a wide variety of products.